Sorry, but the book is now completely sold out. Neither I nor Bee Cool have any copies left at all. Thanks for making it such a complete sell out and such a success ! The Northern Soul scene has encompassed a wide range of musical styles; street corner Doo-Wop, through gritty R & B and sanctified southern Soul to driving, hard edged Funk. 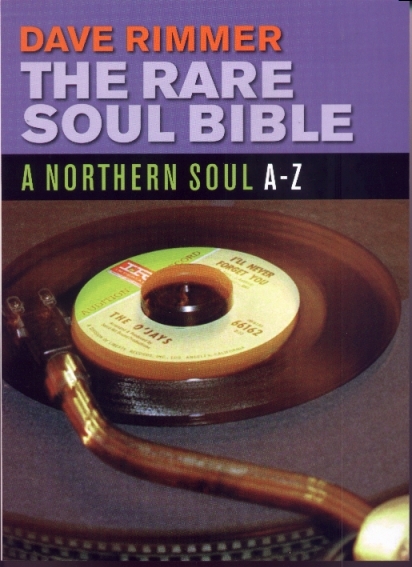 Dave Rimmer, Northern Soul DJ and editor of the informative fanzine Soulful Kinda Music, has put together this exhaustive compilation, which catalogues thousands of 45s by artists who are connected (in some cases, often by just one release) to the scene. Also included are previously unseen artist photographs taken by the author, label scans of over fifty rare Soul singles, biographies of over 25 artists, a year of venue reports, and Dave's forthright views of the contemporary Northern Soul circuit. The Rare Soul Bible is a route map for the serious Soul vinyl addict. Copies are £25.00, plus £1.80 postage (UK Price Only). Postage to Europe Is £3.50, and to the USA is £6.50. Further details on ordering a copy can be obtained by emailing the author here.